I have been watching most of your TKD videos as well as your book on TKD Kicking, and there is something that puzzles me a lot which is the use and effectiveness of sidekick in sparring. from what i have read or noticed, sidekick is not used very often in sparring. my big question is WHY? I see sidekick has the same kind of impact as a back kick and yet it can be executed as quick as a back kick with the advantage of keeping your opponent in sight instead of turning away and lose sight of your opponent. i often feel a lot more confident in using a sidekick rather than a back kick because i can keep my eye on my opponent and i can target far better than a back kick. from your book, it mentioned that it is difficult to score with using sidekick. why is that? by the way, i am also a big fan of Bruce Lee, and apparently Bruce Lee used a lot of sidekicks in combats and it can be an extremely powerful kick. I am just hoping with your extreme knowledge, skills and experience with TDK, you can shed some light on the reasons of why or how sidekick is not an ideal kick in sparring. i thank you in advance for your time and effort and i look forward to your reply. My name is Daniel and I would like to ask you for some advice on how to improve kicking with my weaker leg. I can execute well balanced kicks with my stronger leg but I can't seem to do so with the other leg. Thank you. 1. Stretch the weak leg muscles well before kicking to warm-up and prevent possible injuries. 2. Strengthen your weaker leg by doing very slow controlled kicks wearing a light (2 to 5 pound) ankle weight. Start with the lightest weight and work your way up. 3. When practicing kicking in the air, choose a specific target before you kick. Do 10 to 15 repetitions of each kick with your weak leg whenever your practice to improve your flexibility and control. 4. Practice 3 sets of each kick on a heavy bag or handheld target at each practice session to develop power. 5. Work on the above four suggestions consistently, at least 3 times per week. You should begin to see results in a few weeks. 6. Set specific goals (like you want to do a front kick at head height) and track your progress in your training diary or notebook. 7. Every two weeks re-evaluate your progress and goals using your training notes and your observations. Footwork is an integral part of almost every martial arts practice routine. From simple stepping and sliding to complex combinations of steps, each martial art uses footwork as a means of setting up attacks and defenses. Taekwondo, however, has a class of footwork that is not found in other arts - the aero step. The most advanced innovation in taekwondo footwork, the aero step can give you a significant edge in sparring, whether in the ring or in the dojang. An aero step is performed by lifting your front or back leg into the air and kicking with your other leg before stepping down. On paper this sounds like a jumping kick, but it is quite different. The aero step is intended to carry you forward or backward, not upward like a jump. In fact, the stepping foot is rarely more than twelve inches above the ground and sometimes it barely skims the floor. The aero step carries several advantages in sparring. Most obviously, it will confuse your opponent as to which leg you intend to kick with. If you begin with a right leg aero step, your opponent will assume that you are going to use your right leg to kick. You can easily surprise him by bringing your left leg up to hit him while he is still focusing on your retreating right leg. Because the aero step resembles the chambering motion for a roundhouse kick, it is easy for your opponent to be deceived and commit to a counterattack too soon, leaving you with the perfect chance to score. Secondly, the aero step is a deceptive way of covering extra distance when kicking. By shifting your body weight forward or backward while stepping, you can cover extra inches or even feet, bringing your kick into striking range before your opponent realizes what's coming. The aero step is also an excellent method for increasing the speed, and therefore the power, of your kicks. When we look at individual techniques later in this article, you will see specific illustrations of how you can increase the power of your kicks. Finally, aero step kicks are impressive to watch and may sway the judges your way in a close match. How do you build strength in your legs, also balance for demonstration and control? (I.e) Hold your leg far out above your head for a side kick or high roundhouse without losing stability or balance or simple having no problem being mobile with your legs. I am in Tae Kwon Do and am almost at a full split, but are there any exercises that help develope pure strength in your legs. Hello, my name is Ragnar and I'm from Iceland. Just about a month ago or so I begun training Karate. I've bought the Ultimate Flexibility: For Martial Arts video already and have found it really helpful as I've never really been very flexible. I am now training for about 40 minutes per day at home (at least) using the Easy/Moderate Workout and often the flexibility for kicking part. I also tend to add a few stretches with a partner (when possible) which I learned in my Dojo and well, after such a short period I already feel much better. I was wondering if you might have any tips on how to train my balance and such? I have found that when kicking I could have a lot better control over for how to land and such and be able to improvise my control over the leg while it's in the air. I am really dedicated to studying this and have/will continue to spend a lot of time doing so. I was also wondering if you would have any suggestions of which videos to buy in order to be able to practise more at home? My Name is Sohail From Scotland I am blue belt in taekwondo I have got your Complete Taekwondo Kicking and Aero Kicks as well. Thanks it's really helpful and great. I want to ask the folowing questions. Whenever I do turning kick my knee cross the target. Can you help me how can i avoid this so my knee don't cross the target? And during the side kick my knee drops. Can you tell me reason for that? I need to break the brick with my knuckle. Can can please help tell me which is the best way of conditioning the knuckles? What is the good exercises to achieve the muscle control? Roundhouse kick is the most versatile kick for both competition and self-defense. For competition, it is safe, effective and powerful for striking low, middle, and high targets. For self-defense, it is useful for striking the knee, groin, and stomach. It is most effective when used in combination with punches, elbow strikes and knee kicks. MISTAKE 1: The most common error when executing roundhouse kick is incomplete rotation of the hip. SOLUTION: For maximum power, rotate your body fully to align your hip, head and feet, and to put your body weight into your kick. 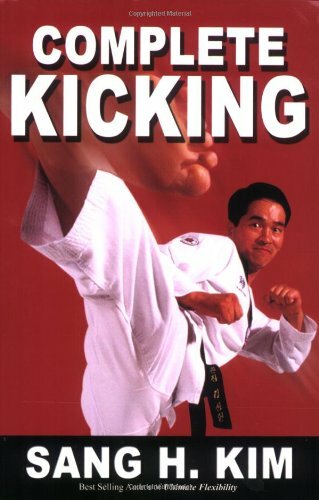 To improve your kicking form and ensure proper rotation in your kicks, practice roundhouse kick holding a support. Start with your back to the wall and your kicking foot in the rear. Pivot so your hip faces the wall and your chest is parallel to the wall. Master Kim's book on Martial Arts over 40 has been a great help in my sparring. I have a question for the Author: I am 53 years old and am currently a Red Belt in Taekwondo. Can I still achieve flexibility in my hips, without causing hip problems later in life? My front kick is well over my head, but my side kicks are only waist high. Many students enjoy heavy bag training, but the uses of the heavy bag are often limited by the number of students in the class. Conventional heavy bag training is done with one student hitting the bag repeatedly for a set period of time. Many instructors have adapted this to fit group classes by letting the students form a line and take turns striking the bag with one or more strikes per turn. This is a good solution for allowing everyone a turn at the bag, but it can get boring over time. This article will look at a few drills you can use for partners or small groups to break up the monotony of heavy bag training. Two students face each other on opposing sides of the heavy bag. At the instructors command, they both begin executing right leg roundhouse kicks until the instructor's command to stop. The students should kick as quickly as possible while trying to maintain a synchronized rhythm. In this segment of Ultimate Kicking Drills, Sang H. Kim shares tips for improving your jumping kicks. Download the free Ultimate Martial Arts Conditioning app and instantly get access to another sample video with over a dozen kicking drills to improve your speed, agility, balance and coordination for kicking.